Khalifa Port Container Terminal, a semi-automated port based in Abu Dhabi, UAE, is ready for the next phase of its expansion that will see its annual handling capacity surge to 2.5 million twenty-foot equivalent units (teu) from the current 1.9 million teu. 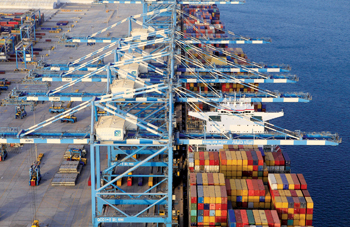 As part of the revamp, three new ship-to-shore (STS) gantry cranes and 10 automated rail-mounted gantry (ARMG) cranes will be added to the facility in 2016 and 2017 to keep up with demand for services, said the port operator Abu Dhabi Terminals (ADT). It is currently on 78 per cent of its handling capacity and the next two years will see ADT enhancing its operational readiness through infrastructural development to meet the expected growth of the local and regional industry. 2015 has proven to be another good one for ADT. As the year’s end approached, it was stated that a total of 1.5 million twenty-foot equivalent units (teus) containers had been handled at Khalifa Port Container Terminal in 2015, up from 1.14 million in 2014. The annual throughput at Abu Dhabi’s container port will grow to 2.5 million teu at the completion of this phase of expansion. The facility has future expansion capabilities to grow its annual throughput capacity to 5 million teu. ADT chief executive Martijn van de Linde said: “Khalifa Port is now firmly on the world map as a key logistics hub which has been achieved through becoming an industry partner for our customers, as well as demonstrating that it offers a cost-effective, fast and reliable alternative to regional ports. ADT has made significant investments in a polymer packing plant and 2.3 million sq ft of warehousing inside the port, offering value-added supply chain services and increasing speed and reliability for shipping lines and trade customers. Meanwhile, Al Mirfa Port in the western region of Abu Dhabi has been inaugurated. Abu Dhabi Ports, the master developer, operator and manager of ports and Khalifa Industrial Zone in the emirate, had completed extensive redevelopment work at Al Mirfa Port, upgrading its infrastructure and facilities to better serve the community. Dr Sultan Ahmed Al Jaber, Minister of State and chairman of Abu Dhabi Ports, highlighted that Al Mirfa Port is a significant landmark within the Western Region, which is witnessing extensive development activities. “Our goal is to implement the master development plan which includes Al Mirfa Port, Mugharrag Port, Delma Port and Sir Bani Yas and we are confident that with the support of Abu Dhabi Ports’ partners, these vital projects will play a key role in the development of the region and support the Emirate’s economic diversification efforts,” he said. Abu Dhabi National Oil Company (Adnoc) will supply fuel to vessels from an offshore platform. Adnoc is also setting up a service centre, similar to its Adnoc Oasis convenient stores spread across the UAE. In addition, Abu Dhabi Ports constructed an ancillary power station to ensure electricity is continuously available at the port. Abu Dhabi Ports recently won the ‘Training Award’ for the second consecutive year at the Lloyd’s List Middle East and Indian Subcontinent Awards.